Prototype: Class 189 electric locomotive as ES 64 F4 for the firm MRCE Dispolok GmbH, Munich, Germany, leased to SBB Cargo International. Multi system locomotive with 4 pantographs. Locomotive road number 189 983 0. The locomotive looks as it did around 2014. Model: The locomotive has an mfx+ digital decoder and extensive sound functions. It also has controlled high-efficiency propulsion with a flywheel, centrally mounted. 4 axles powered through cardan shafts. Traction tires. The triple headlights and dual red marker lights change over with the direction of travel, will work in conventional operation, and can be controlled digitally. Maintenance-free warm white and red LEDs are used for the lighting. The headlights at Locomotive End 2 and 1 can be turned off separately in digital operation. The locomotive has a double "A" light function. Long-distance lights can be controlled digitally. Maintenance-free warm white and red LEDs are used for the lighting. The cabs have interior details. The locomotive has separately applied metal grab irons. Length over the buffers 22.5 cm / 8-7/8". 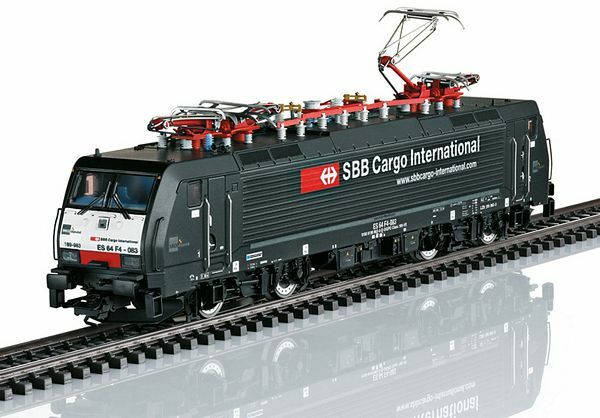 Freight cars to go with this locomotive can be found in the Marklin H0 assortment.